Most of us have at least one portable project on the go. These little bags are the perfect thing to keep your work clean and in one piece. Blue Sky Alpacas make a simple, pretty cheap bag that comes in a variety of cute colours (only one size) that vary with availability. Pictured center, below. Our most popular project bags have to be by Slipped Stitch Studios. 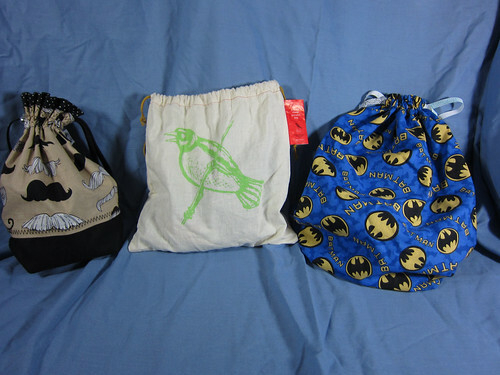 These handmade fabric bags come in a range of sizes from sock bags to full-sized sweater or blanket bags. Fabric choice change constantly – if you find one you like, snap it up because odds are it will never be available again. Pictured left, above. And todays inspiration is triangular scarves/kerchiefs. They can be working in any weight, with pretty much any amount of yarn (or yarns). The perfect stashbuster, easy to wear, no pattern required for the most basic (CO5, increase one stitch at each edge and two at center every other row), or go fancy! My current favourite is this Age of Brass and Steam Kerchief by Orange Flower. This entry was posted on Tuesday, December 11th, 2012 at 10:00 am	and is filed under Advent. You can follow any responses to this entry through the RSS 2.0 feed. Both comments and pings are currently closed. I’m loving these advent posts, and I love that scarf! My Daughter and I just made matching bags. We chose to use oil cloth instead of laminated cotton – we love how they turned out. She just started sewing 2 years ago and I have been sewing for 40 years and we really enjoyed the project! The bag on the right was homemade as well – perfect because it lets you customize it to your heart’s content! Ok so I literally downloaded this pattern about 5 minutes before reading this. A sign from the Knitting Godesses? Too bloody right! 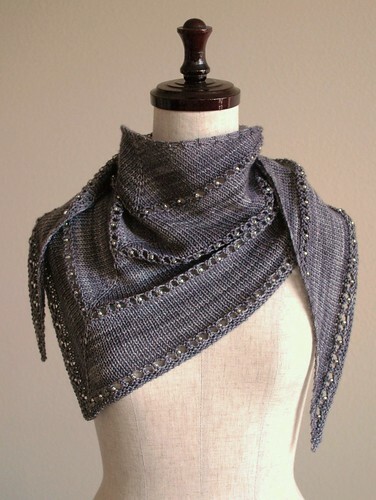 I’m going to try it in Malabrigo Rios. Hey, when you get a knitting sign you’d better pay heed! Can you tell us whatyarn the Age of Brass and Steam in the pic above what knit from?